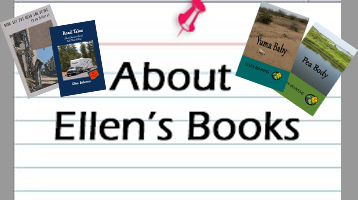 Tony Hillerman once said, “A writer is like a bag lady going through life with a sack and a pointed stick, collecting stuff.” Sitting next to me is a pile of papers, clamped with one of those binder clips — my version of the pointed stick. I confess: it’s not so bad being a bag lady. Often I’ll come across just the right tidbit that frees me from some tight spot I’ve wedged myself into. And the rest of those bits of flotsam and jetsam? Well, I save those for you, of course! 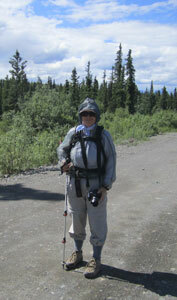 Okay, my pointed stick is a hiking pole… and I don’t have a bag, but it’s a funny photo of the gitty-up we wore to hike among the mosquitoes a few years ago in Alaska. A: Two. One to screw it almost all the way in and the other to give it a surprising twist at the end. “Nature, time and patience are the three best physicians.” Write about how one of these helps heal you — or your main character. A wood sculptor has offered to carve a totem pole for you (or a main character in one of your manuscripts). What animals will be represented? Why? In what order (from bottom to top)? Why that order? Write using one of these as a setting. Write about the person who put these signs up and the sort of day they were having. What have you picked up with your pointed stick lately?